These airmen inspect the Air Force's aerospace weapons systems for structural integrity, a painstaking job that is obviously crucial to the success of its astronauts and airmen. They use so-called nondestructive inspection methods, meaning they're not blowing anything up or trying to push parts to their breaking points. Rather, they’re trying to find the tiniest of unseen imperfections that, while not necessarily visible, could be catastrophic if not identified and repaired. They use equipment like X-rays and ultrasound machines to find these tiny flaws and recommend fixes based on what they find. Their work helps the Air Force keep its systems running smoothly and safely. The Air Force categorizes this job as Air Force Specialty Code (AFSC) 2A7X2. The primary duties of airmen in this job is to find anything that’s wrong with Air Force aerospace weapons. They inspect the weapon systems’ components and support equipment for structural integrity and perform fluid analysis. This may include inspecting metal engine parts for wear and tear, and checking that lubricating oil and other fluids are not seeping into any cracks. These airmen also conduct radiation testing, computing and monitoring personal exposure areas for radiographic operations, ensuring that levels are safe for Air Force personnel. They’re also looking for the previously mentioned imperfections, such as cracks, delaminations, voids, processing defects, and heat damage using penetrant, eddy current, magnetic particle, radiographic, optical, and ultrasonic test equipment. It’s up to them to examine metallurgical properties of an engine and other components according to alloy, temper, conductivity, and other related factors. In addition, they perform operator maintenance and service inspections on shop equipment and tools and handle and dispose of hazardous waste and materials. 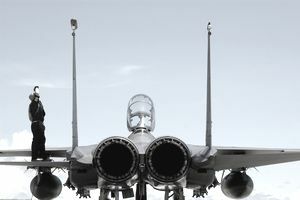 This job requires knowledge of the characteristics of metals identification; wear metals identification and content; metal discontinuity and flaw detection; operation and maintenance of nondestructive test and oil analysis equipment; safety codes and practices; radiological safety and radiation monitoring procedures. Recruits can qualify for this job with a score of 44 in the Mechanical (M) segment of the Armed Services Vocational Aptitude Battery (ASVAB) tests. If you’re interested in this job, you’ll also need to complete two courses in nondestructive inspections, a basic and an advanced. A high school diploma is required, and a transcript which shows successful completion of high school mathematics, chemistry, industrial technology, physics, and shop is desirable. Completion of computer knowledge courses also is helpful. Normal color vision is required (so, no colorblindness) and the minimum age is 18. You also must be a U.S. citizen. There is no Department of Defense security clearance required for this job. After completing basic training and Airmen’s Week, technical training for airmen in this job takes place at Pensacola Naval Air Station in Florida and lasts approximately 49 days. While a lot of the work you're doing is specific to the military, you'll be well-prepared for a post-military career as a mechanic. The skills you'll learn will likely qualify you to work for a garage that conducts vehicle inspections.